The original King Kong from 1933 is an all time cinematic masterpiece. It revolutionized special effects and told an emotional story with a giant ape at it's center. There's been many reboots to the series with the most recent coming from Lord of the Rings director Peter Jackson in 2005. Hitting theatres this weekend is the second film in the shared Legendary Monsters universe. The world that started with 2014's Godzilla has now expanded to include everyone's favorite giant primate. But...is it any good? Well, yes. And no. There's some incredible things about this film. There's also some really bad things about it. Let's start with the bad. There's a good story in this one. However, the script is terrible and the human characters are completely forgettable. That's saying a lot when you have such amazing actors as Tom Hiddleston, Brie Larson, Samuel L. Jackson and John Goodman. Only John C. Riley's character stands out as the crazy old World War II vet that's been stranded on Skull Island for 28 years. The random assorted soldiers are in here simply for cannon fodder. No one cares about them. Hiddleston, Larson and Goodman are all wasted. They perform their parts well but unfortunately what they're performing is a script that's the cinematic equivalent to hot garbage. The humor failed to land 90% of the time. The 10% that worked all belonged to Riley's character. The fact that I just saw the movie and can't remember any character's name immediately after walking out says more than I can about how important they are. They're just here to progress the plot. Speaking of the plot, I'll give a quick synopsis for you. A scientist that everyone thinks is crazy convinces the government to send him and a team of soldiers to investigate an uncharted island. While everyone assumes it's just a mission to explore the island, the crazy scientist actually went there to prove his theory that giant monsters roam the earth. Sure enough, Kong shows up and does his monkey smash thing while the crew try to reach the extraction point to get the hell out of dodge. 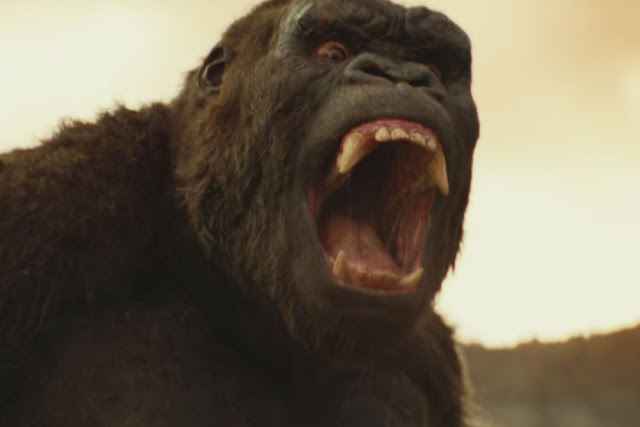 There's generic in fighting amongst the group where one faction wants to kill Kong while the other half sees him as the savior against the other monsters roaming Skull Island. In a sentence I never thought I'd say, the standoff between Kong and Samuel L. Jackson is satisfying. It also ends exactly how you'd expect it to. What makes this movie work is the fact that it's a King Kong movie, and boy does he shine here. This is the biggest and most aggressive Kong we've ever seen. He smashes and fights the other strange monsters crawling all over the island to protect the natives. He's their God. Like the original Kong, this version has a personality and seems to be compassionate. He's simply defending his home against invaders. The visuals truly are stunning and Kong has never looked better. His fight scenes are a true marvel and will make any fan of giant monsters giddy with excitement. His first real appearance fighting off the army helicopters is an incredible introduction to this character. His battle with the Skull Crawlers was reminiscent of the original's fight with the T-Rex, but this one is much faster paced and far more brutal. While Kong's signature finishing move wasn't present here, he more than made up for it in sheer spectacle. I really cannot say enough about how beautiful both Skull Island and Kong himself are. In fact, all of the creature designs are phenomenal. This movie is basically a big budget B-movie. I'm OK with that. These giant monster movies have rarely been high art. What this lacks in substance, it more than makes up for in spectacle. It did manage to create a new mythos for the character of King Kong. Instead of being brought to New York and climbing the Empire State Building, the whole film takes place on Skull Island. It even explains what happened to Kong's parents and how he's the last one left. These are nice touches. 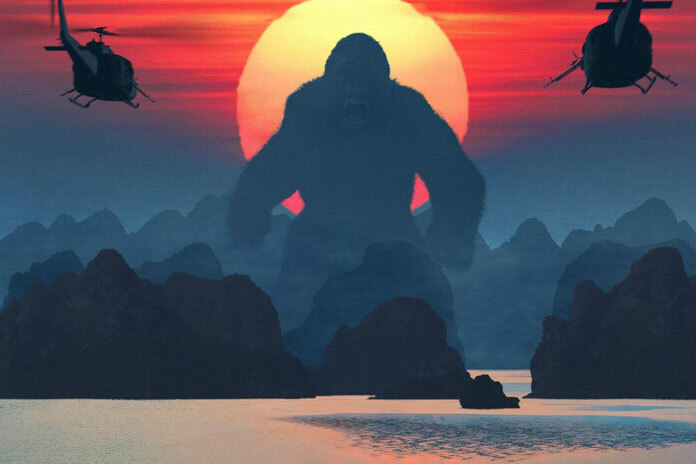 Kong: Skull Island is basically a placeholder to expand the universe and introduce more monsters. It feels like a set up to the inevitable clash between Godzilla and King Kong that's rumored for release in 2020. While the story in 2014's Godzilla is better to what's presented here, Kong: Skull Island's monster battles are superior. If you go into this looking for a great story, you'll be disappointed. If all you want is giant monsters doing battle in spectacular fashion on the big screen, you'll dig it. Overall, it's worth seeing in the theatre. While the human characters are sorely forgettable, the gratuitous screen time for Kong and other monsters more than makes up for it. It's a big dumb fun action movie. That's all it's supposed to be and it definitely succeeds. Be sure to stick around for the post credits scene. There is one and it's a doozy. Looks like this universe is about to expand again! Woot! Sounds like it's worth seeing on the big screen just for the visuals and the fight sequences. Can't wait to see God-Emperor Kong in all his glory. If you have any interest in seeing it, the big screen is the way to go! The visuals alone are worth it. The story, eh, not so much.